Earlier this month, we shared our Initial Views on the Children and Families Bill. Since then, we have had chance to look at the Bill in more detail and wanted to share our views and more importantly to discuss "the missing pieces". As parents, we know the current system and its failings far too well so we welcomed the introduction of the Green Paper and the excitement of being involved in Pathfinders. However, the Bill that we have been offered isn't quite all that we were hoping for. The reforms offered, "a new approach to special educational needs and disability that makes wide-ranging proposals to respond to the frustrations of children and young people, their families and the professionals who work with them" and a vision of reforms to, " improve outcomes for children and young people who are disabled or have SEN, minimise the adversarial nature of the system for families and maximise value for money". What we've been given in the Children and Families Bill has not quite lived up to the hype. Disabled children and young people without SEN. 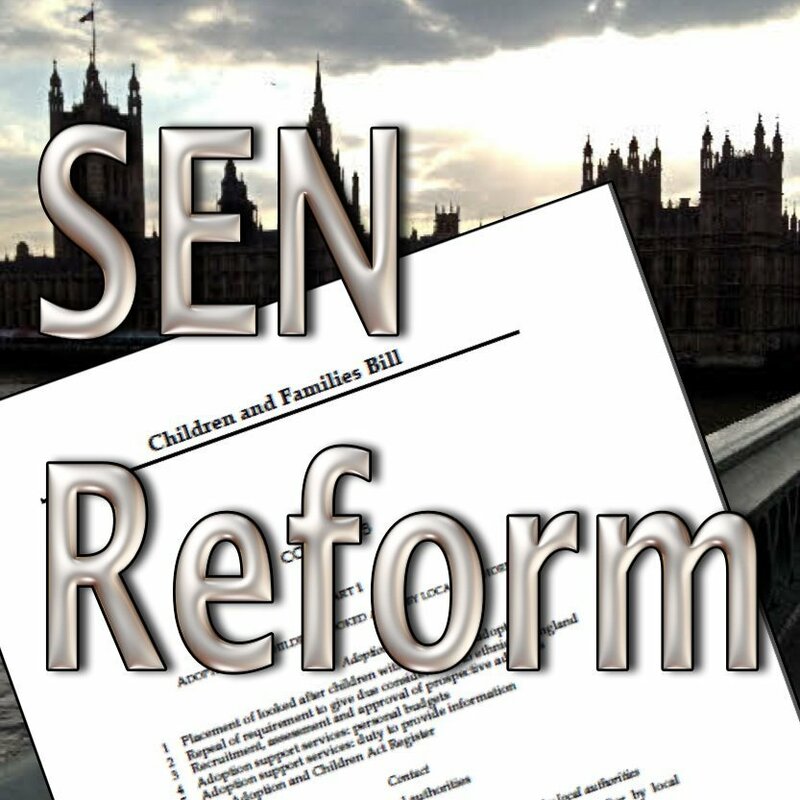 Despite the Green Paper offering improved outcomes for children and young people who are disabled or have SEN, the Children and Families Bill is only offering the new EHCPs to those with SEN. This decision shows a real lack of understanding from the DfE about the difficulties that children and young people with "just" a disability (and no SEN) face. The Children and Families Bill suggests that the needs of these group will be met by the Local Offer. Local Offer - Minimum Standards. Currently, the DfE are suggesting a "common framework" for the Local Offer. This could possibly (and will most probably) result in a postcode lottery. As the Local Offer is being offered as the alternative to EHCPs, there needs to be much clearer legal obligation of minimum standards for Local Authorities. "Minimum" indicates that something is the very least which could or should happen. "Framework" indicates a skeletal structure designed to support something. There does not appear to be, within the Bill, a "duty to provide" the contents of the Local Offer, just to publish it and that a local authority "may" wish to review it "from time to time". All a little bit wooly. School Action/School Action +. There is no mention within the Bill as to how the needs of children currently on SA/SA+ will be met. Again, if the Local Offer is to be the alternative then this needs to be much more prescriptive to Local Authorities. The DfE says the replacement structure for the present lower categories of SEN will be defined in the new Code of Practice which is now starting to be drawn up - interestingly by a different team of officials to the one that drafted the bill. Hmmm. No duty on health or social care to provide the services within the EHCP - just an obligation to jointly commission with the local authority. There needs to be an realisation in government that the words "Joint Commissioning" aren't a new magic spell - a sort of Abracadabra for SEN. Optimistically repeating the "Joint Commissioning" mantra doesn't mean it's, as if by magic, just going to happen. No specified time frames from when you apply for an EHCP assessment to when you receive an assessment and more importantly, a EHCP. Currently, it takes 26 weeks from applying for an Assessment of SEN to actually receiving a Statement of SEN. This, as a parent, can seem like a lifetime (especially if you only hear about the need for a statement a short time before your child attends school - and yes, this is more common than people like to admit). However, you can see a light at the end of the tunnel with a deadline of 26 weeks. The new Bill does not provide any defined time scales and this is essential for families. It does say that the regulations may make provision for this - but "may" should really be replaced with "must" as this is a key point. Key worker - throughout the Green Paper, there was mention of a key worker for families. One person to go to, who would help the families through the jungle but there is no mention of this within the Bill. This is one of those key features that really excited a lot of families. The ability to have one person; one person who would repeat your story for you and point you in the right direction to access the support your family needs. This is one aspect of the initial aspirational Green Paper that needs to be clarified - both for families and practitioners. Was this just an absent-minded omission from the Bill or has the DfE decided to quietly sweep this innovative and important role under the carpet? Note to DfE: if it's the former, someone needs a slapped wrist, if it's the latter, you've been rumbled so put it back in, pronto. Or is this another point for the "regulations"? Time - the current Bill is scheduled for Royal Assent in Spring 2014 (i.e. passed into law) with September 2014 being proposed for when this will come into practice. How will Local Authorities and PCTs manage to train all the necessary staff in this short time (especially with a 6/7 week school holiday in that time)? Ask any parent and they will say the same: they would far rather wait for another six months so that LAs can get all their recruiting and training in place (not to mention their funding arrangements) than inherit a chaotic mess where no one knows what's going on, where the money is coming from and half the staff still hanging on to the old adversarial ethos. While we're on the subject of culture change, a DfE official did mention to us that he thought re-training to effect culture change should be starting now. I would be really interested to know what funding or provisions or courses there are in existence or planned, to begin this process - which is arguably one of the most important parts of the entire process. Indeed, it might be a little controversial to suggest, but if a root and branch programme of culture change within LA SEN departments had been put into practice to start with, there may have been less need to overhaul the entire system. The new Children and Families Bill does have the potential to provide children and families with, "A new approach to special educational needs and disability" and to, " improve outcomes for children and young people who are disabled or have SEN, minimise the adversarial nature of the system for families and maximise value for money" but not without some more thought and considerable tweaking. I have been asked to take part on the new plan being a home educating family. So far it appears to be chaotic. No involvement with health and the project leaders are determined it will go their way – every time I question something it is seen by them as being picky even though I am asking about their guidelines which they are not following. Hilary, I initially read this and thought “wow, home educators being involved” as I know several LA’s have not included them but then I read the rest of your comments and the “wow” really disappeared fast. What do you think needs to be added to the legislation to make it more effective for families? Already I am seeing the lack of impact of resources with SEN resources in education so sad.